Yesterday completed one month of official training for the Colorado 100 race in early Sept. In general, I’d rate it a success. I’ve really learned a lot (and paddled a lot). I was worried how I’d handle the stress of logistics; getting on the water 4 days a week while being a full-time employee. I’d have to say, this has been the easiest of challenges. There have been a couple of days at work which were physically demanding where I’ve thought, “I’d just like to go home.” But I didn’t think twice about it and found myself at the end of the day in my cockpit where I belonged. There have been 2 days I didn’t paddle that were scheduled; one due to winds and another where, psychologically, I just needed to go home and do nothing. What has been more stressful is the wind. How windy will it be after work? How windy will it get when a small craft advisory is predicted (almost every day now). How reliable are the wind predictions? How will I perform in the wind?Recently a local weatherman said our weather to date has been like early spring. With regard to the winds, that’s the windiest season here in the Bay Area. I’ve been looking for to the normal decline of wind as the summer progresses. Now it’s almost July, and we’re often getting warnings of winds at 25-30 kt. I didn’t really have doubts my body would handle the long paddle days as long as I put in the required daily training. After the first 20 miler I began to feel the stress. The hours after that first 20-mile paddle and the day after were the first time I felt a little soreness and “systemic tiredness.” Yesterday a 25 miler was scheduled and from the beginning I knew it was going to be a challenge. It felt more about “mental wrestling” than physical. I just couldn’t get my mind around being in the cockpit for 6 hours or more, and I was obsessing about what the route was actually going to be. I wanted to get around the island, but there were no guarantees the north point would be passable. And yesterday as I approached the northern tip three kayakers came towards me and warned how windy and choppy it was. They had decided to turn back. A wind advisory was already posted and the tide was racing out (wind/tide in opposite directions), so I wasn’t optimistic. After taking a look myself, I too retreated; I was solo. On a more optimistic note the wind was negligible in the channel. Now I was only going against the tide for less than an hour. This then created the dilemma of the route I would take to cover the required 25 miles. 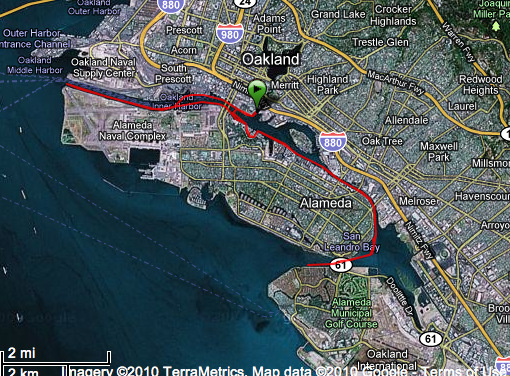 While I was paddling I began all the mathematical computations and ways I could go to make the mileage. I paddled all along the east side of the island and around the southern tip but was halted by an extremely low tide. No getting into the Bay this way for a few hours. Back I went the way I’d come and figured I’d get back to the starting point with about 20 miles under my belt. Well, I’d just have to paddle around in circles I guess to get those extra 5 miles in. Then on the way back I hit the incoming tide which was incredibly strong, and the first time in this channel where I could barely make headway against it. Maybe I haven’t used enough adjectives as yet to describe to you the horrible day I was having. Oh, that’s right, this rant is public! After a couple of miles fighting the current those core muscles were really tired (good sign my arms weren’t). I had a neckache, a headache and I just kept making bargains with myself to get to next selected spot ahead of me to keep me going. I tried to tell myself this would pass, pretty soon I’d feel OK. But I just kept feeling worse, physically and mentally. When I spied my starting point I told myself 20 miles was enough! I was not having fun. I was really spent as I exited my kayak and stood (or tried) on the dock. At that point I was sure I had made the right decision to cut my day short. I just wanted to get packed up and get home. So, I felt a little failure with regard to my expectations yesterday, but it was the 2nd weekend in a row I’d completed 20 miles. And, next Sat. no increase in mileage. Yes, 25 miles again! I learned the shoes I was wearing were not going to work (my old kayak shoes disintegrated last Mon.). My MSR Dromlite is working great. I’m remembering to eat and drink on time. The clothing I’m going to wear for the race is being tested and all is well, I just need to get a short sleeve top for all this summer training. The training miles are adding up. I think the first month ended with a total of 118. So begins the SECOND month with 9 miles tomorrow. Wed. is a 6 mile time trail. I get to compare it to the 6 miles done a month ago. July 10, calls for 30 miles and my coach is taking me to the lower Sacramento river where we’ll be paddling together. Now the biggest challenge seems to be completing the super, long Saturdays, and WHERE to paddle the super, long Saturdays! This entry was posted on June 27, 2010 by DummyDiva. It was filed under Uncategorized and was tagged with Colorado 100, kayaking, outdoors, paddling, training, ultra marathon kayak/canoe. San Rafael Bay/China Camp area offers some protection from NW and W winds. Regardless it’s never so chaotic as the north of the estuary. Below is a link to a map with a 12.5(ish) route. Be careful with tides though, China Camp can get seriously muddy on a low tide. It’s also $5 to park. If it is too muddy try McNears, just down the street. You can do six hours – or more – in the cockpit. I am not a racer, I do long distance touring, so the pace is different. But I have done 14 – 16 hours in the cockpit on a number of occasions. If I can do it, you can! For me the key is every now and then moving my legs about, and getting blood flowing. I will pop my feet out of the foot braces, and wiggle my toes. Pull my knees together for a bit, with my feet flat on the hull. You can do this. Thanks soooo much for your encouragement. I sometimes think it’d be a lot easier if I could paddle with people more, especially the long days. So your words help. If you’re paddling into that sort of tide for a long time you can look on the bright side and consider that in reality you’ve effectively paddled a lot more miles than show on the map- like riding a bike on training rollers! I’m sure you’ll do it.